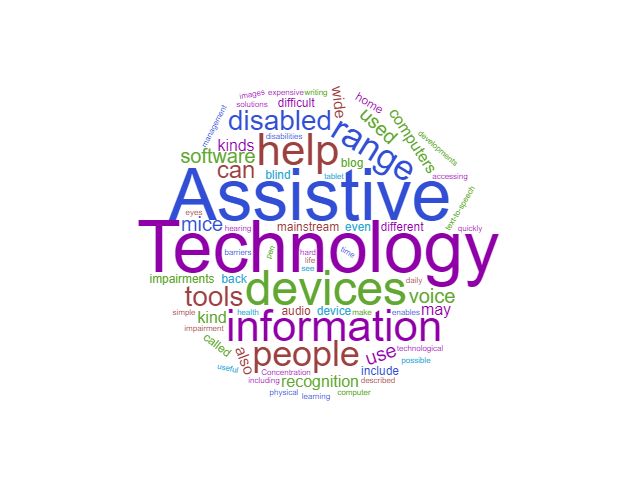 Assistive Technology is a term that covers tools designed to help someone who has an impairment or is disabled. These kinds of tools date back to the first time a person leant on a branch to help them walk. Modern technology has spawned a vast array of technological aids for the home, the office, or for public life or leisure. Many kinds of technology which were only available as specialist purchases are becoming more mainstream. For instance, voice recognition software is now in all smartphones, Windows PCs and Macs, as is text-to-speech software. Even televisions can also have voice recognition and text-to-speech built-in. What can technology do for disabled people? Whether you agree with the label ‘disabled’ or not to describe yourself, if you have an impairment then you may come up against barriers to full participation in some aspect of life. There is a wide range of technological solutions to overcome these barriers. Concentration or retaining information may be difficult for some people due to what are called specific learning disabilities. These can include dyslexia, dyspraxia, ADHD or autistic spectrum disorder. Concentration and focus may also be an issue for people with other learning disabilities, brain injuries, mental health issues or physical health conditions. What kind of technology can help? The simplest kind would be a simple recording device so that spoken information can be played back. Recording devices can be even more specialised such as the Livescribe pen which can record and play back the audio from touching the pen to handwritten notes. Text to speech technology enables the written word to be converted to audio. This means information can be absorbed through more than one sense i.e. both eyes and ears at the same time and this can help with focusing, remembering and processing information. People think in different ways and some technology enables different kinds of images to be created to help with processing and organising information. Mindmapping software allows information to be collated quickly and easily rearranged into a more coherent and meaningful presentation quickly. The use of colour and images in this kind of software can help create pictures of information in more memorable formats than straightforward text. Software to help with planning and task management ranges from simple to do lists, through calendars to complex project management software. Of course these tools are useful for people who are not disabled too. The more that mainstream devices include tools like these more inclusive they are for the wider range of people? All of these tools so far involve use of a computer. Some impairments make accessing mainstream computers more difficult. There is a wide range of input devices used to access computers or tablet devices. Input devices are simply tools for writing in computers. Keyboards are the classic example of this. They can be difficult to use if you are blind or have pain, paralysis or reduced control of your hands. Technology that can help includes voice recognition and a range of ergonomic keyboards adapted to different capabilities and physical characteristics. Computer mice are described as pointing devices but are also involved in inputting information and can be used with on-screen keyboard too. Specialist mice can range from upright or angled mice, joy sticks or large roller balls, trackpads or mice with pointers that are used by moving the head, breath activated mice or eye tracking technology. These tools make it possible to use a computer to communicate, work or browse the web even when you only have mobility in your eyes or a few muscles. It is even possible to read and write Braille by connecting a device called a braillenote to a laptop or tablet. Computers are not just used for reading and writing or accessing entertainment. They are inbuilt to a wide range of devices – a range which is growing daily. Recent developments such as the Amazon Echo devices and Apple HomePod have brought voice recognition to everyday devices in what is called the smart home. Smart devices can be especially useful for disabled people in the home. Lights, curtains, doors, fridges, and electric sockets can all be controlled with computers through voice or the kind of input devices that have been described above. All of these developments can contribute to greater independence for disabled people whether impairments are visible or not, mild or severe. Smart Technology is not without its cautions or drawbacks and these can be hard to navigate if you are not confident in understanding the information out there. Over the next months we will be posting more information on a range of technology here and in our blog . We will also be expanding the information we have in our Info Guides . Do let us know if there are particular topics you would like to know more about. In the meantime, you may enjoy exploring some of the links below to further information. This website is for those parents, teachers and pupils of school age children. However much of the content is relevant to any disabled people. There is a wealth of information on a wide range of Assistive Technology including free programs. An article from 2014 showing some technology and what it can do for blind users. To learn a bit about the range of Assistive Technology for hearing impairments check out the blog below.